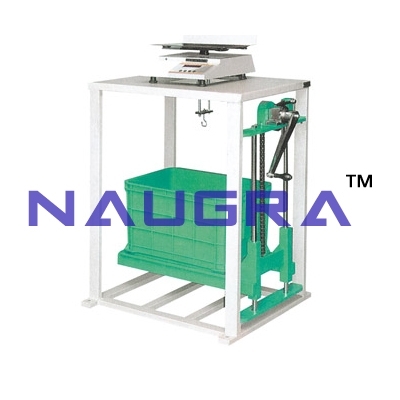 Specific Gravity & Water Absorption of Aggregates For Testing Lab for Aggregate Testing Lab - This Set Is Used For Specific Gravity, Apparatus Specific Gravity And Water Absorption Of Aggregates. Specification : The outfit comprises of 1. Electronic balance, capacity 5 kg. Least Count 0.1gm, provision is made in this balance to suspend density basket under material pan. This balance is mounted on an angle iron frame stand. 2. Density basket. 3. Air tight container to suspend density basket. 4. GI Tray of area not less than 650 cm sq. 5. Absorbent cloths 75cm x 45cm..
We are leading manufacturers, suppliers & exporters of Specific Gravity & Water Absorption of Aggregates For Testing Lab for Aggregate Testing Lab. Contact us to get high quality designed Specific Gravity & Water Absorption of Aggregates For Testing Lab for Aggregate Testing Lab for schools, colleges, universities, research labs, laboratories and various industries. We accept bulk orders for government tenders in all countries around the globe. For similar products visit at main page of Aggregate Testing Machines.